The May 23 meeting of the RASC Mississauga Centre will feature a talk on Quasars and Black Holes. A black holes is inferred to exist at the center of every massive galaxy, including our own Milky Way. We cannot see such a black hole directly, but we can see light from hot gas orbiting the black hole. 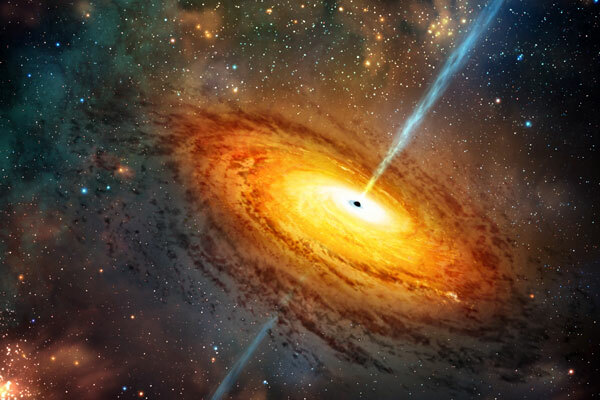 This gas forms a disk larger than the Earth's orbit around the Sun and hotter than the surface of the Sun, putting out enough light to be seen across the universe; we call this light a quasar. Pat Hall is an astronomer and Associate Professor in York University's Department of Physics and Astronomy. Born in California to Canadian parents, he double-majored in Physics and Astronomy at U. C. Berkeley and obtained a doctorate in astronomy at U. Arizona (even if it took 7 and a half years). He then studied galaxies as a postdoctoral fellow at U. Toronto and quasars as a joint postdoc at Princeton and the Universidad Catolica de Chile before joining the faculty at York. Enter off of Mississauga Road. Park in lot 4 or the parkade, across from the fitness centre south of theDavis Building. Enter through the Fitness centre, walk up the stairs untilyou reach the main corridor then turn right. (If you need an elevator,follow the corridor to the right of the stairs, then go up to the mainfloor.) Look for the Mississauga Centre sign in front of the lecture room. For directions see this online map.